Q-KON is a South African based engineering group that provides turn-key solutions and managed network services to the emerging African market. Since its inception Q-KON has differentiated itself in providing solutions and services supported by long term relationships and continued value add. Today QKON can proudly look back on almost 20 years of engineering achievements throughout Africa underwritten by sound business practices and long-term ethical relationships. With services currently in more than 40 countries and projects completed in over 30 countries throughout Africa, Q-KON is well established and experienced within the Africa market. This respectable position was achieved through Q-KON's strategy to establish mutual beneficial relationship with local and regional service providers within all territories. 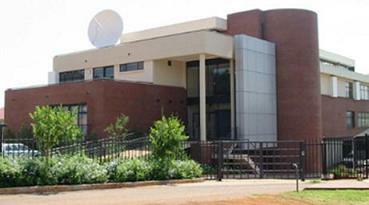 The que-Vi satellite network solution is a star-network that provides seamless end-to-end IP connectivity from any location in Africa directly to the Teleport at Biddinghuizen. Customer Head Office networks can be integrated to the remote office through secure VPN architecture. The satellite teleport infrastructure is located at Carrier2Carrier in Biddinghuizen, Netherlands. C2C owns and operates a large antenna park with a combination of 9 meter and 6 meter antennas pointed to major satellites. The teleports is connected to the European terrestrial fibre network to extend connectivity to corporate head offices and other fixed locations. 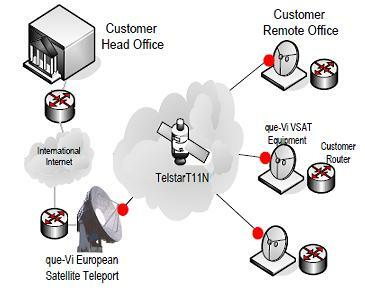 Telstar T11N provides Ku-band for North and Central America, Europe, Africa and the maritime Atlantic Ocean Region. The satellite is positioned at 37.5 degrees west orbit longitude and accommodates 39 high-power Ku-band transponders, each with a capacity of 36 MHz bandwidth. The satellite was launched on 26 February 2009, with a lifetime of 15 years. Link Budget map, dish size and BUC power needed. 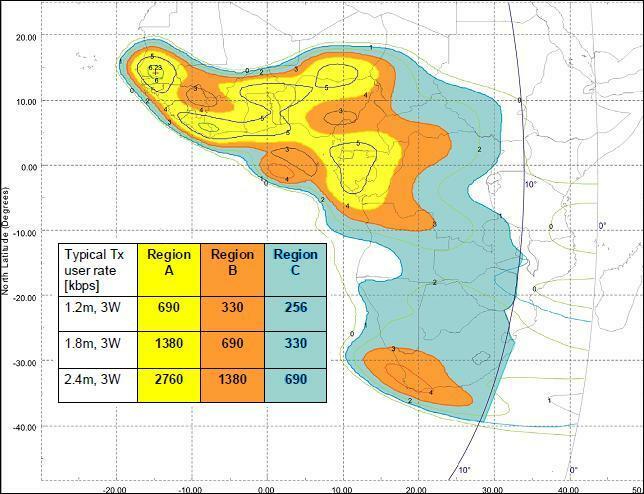 This map below shown the uplink beam G/T contours. The most sensitive parts of the beam permit higher uplink transmit bit rates for a given dish size and transmitter (BUC Watts) power. Telstar 11N Link budget coverage map, showing the dish size and BUC power needed for different transmit bit rates. A larger dish will always improve down link margin. 1.2m, 1.8m or 2.4m satellite terminals may be installed at any location within the satellite communication coverage area. LinkStar is the star-based VSAT system for service providers, ISPs, and corporate network managers who are seeking a system based on DVB standards. LinkStar's edge is in its dynamic bandwidth allocation that makes it more efficient and faster than other TDMA systems. The satellite terminal components are: Outdoor equipment: Antenna, Feedhorn, BUC (transmitter), LNB (receiver).Indoor equipment: Linkstar satellite modem. Q-KON can offer the following options to ensure regulatory compliance of satellite equipment & services deployed by its customers. Where Q-KON will not be able to secure licenses timeously, it has secure partnerships with other licensed in-country operators. Q-KON is currently able to provide services in the following regions via a partnership arrangement: Angola, DRC, Mozambique, Nigeria, Ghana, Malawi, Tanzania. In certain circumstances it is preferred by customers to hold their own operating licenses rather than operate under the license of a service provider. Should this be the preferred customer option, and be possible within the specific country, then Q-KON will assist the customer in the completion and submission of the applicable regulatory application forms. The Q-KON NOC maintains a central management centre with network management systems and network engineers supporting networks across Africa. Q-KON has extensive experience in providing mission-critical network management for our customers and is the primary network control point for our customers' enterprise networks. 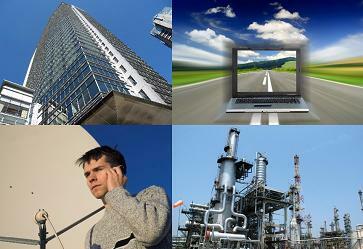 Network management functions applicable to our customers are monitored via Network Management Services (NMS) platforms. These are integrated NMS platforms with software/hardware tools to track and monitor all aspects of network activities and the performance of the network. All warranties on equipment supplied will be supported by Q-KON on a swap-out basis for the length of the warranty. All equipment is covered by a one-year warranty period. Q-KON recommends that the customer hold a suitable quantity of spares onsite where services are provided in remote, inaccessible regions where shipping and travel delays could prolong downtime. All faulty equipment must be shipped to Q-KON for replacement (if under warranty) following any maintenance or repair work. Following the repair or replacement of parts, Q-KON will ship the equipment to restock the customer spare-holding. All costs to effect same will be for the customers account. Q-KON recommends that critical components be spared onsite to avoid downtime as a result of shipping delays. Q-KON offers a full support contract for the VSAT services covering ongoing maintenance, monitoring and spares management with guaranteed service levels. Q-KON via the SLA will provide a minimum availability guarantee of the 99.5% on a monthly basis. 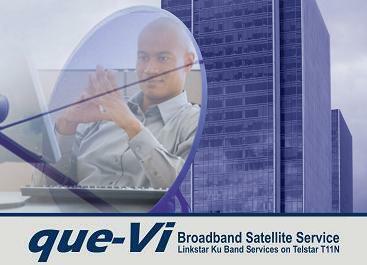 The Guarantee is applicable to the availability of the following network components: (1) The satellite hub & teleport. 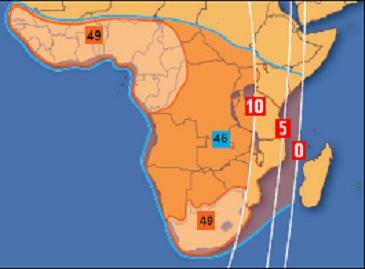 (2) The satellite communication channel. Q-KON will provide a service level agreement for the VSAT equipment at the site provided spares are kept onsite at the customer's premises. Failing this, repairs are subject to the availability of spares. Should the customer opt to keep spares at the site, Q-KON will guarantee a restoration time of 4 hours from the arrival of the engineer onsite. Every attempt is made to resolve problems through the normal support centre, however at times engineers will be required to travel to the site if it cannot be restored remotely. I have written this page at the request of Q-KON. The information and images were provided by Q-KON and are used here with their kind permission. This is not a paid for advertisement.